If you think the public doesn't pay attention to how our Masonic halls look on the outside, think again. We read a lot about Masons helping their communities, but this is a unique story of a young man deciding his town's local lodge needed help he could provide to them. 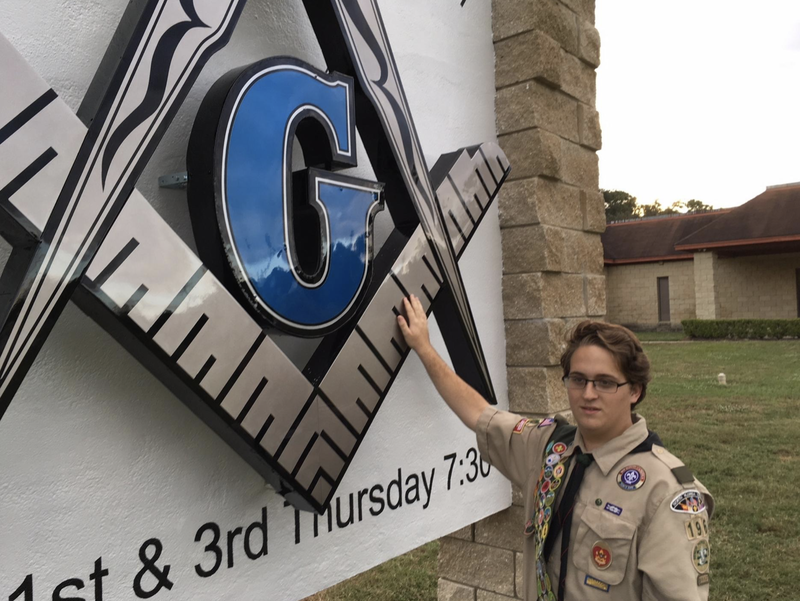 Seventeen year old Eagle Scout candidate Austin Sherwood took on a community service project in Ocala, Florida, and he noticed that the signage of his local lodge had been in in need of a facelift for several years. Their old sign wasn't an eyesore, but it was generic and not illuminated at night. 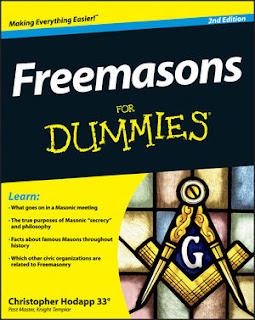 So, Austin used his computer and drafting skills to help out the members of Marion-Dunn Lodge No. 19 in Ocala by crafting a more impressive public face for them. 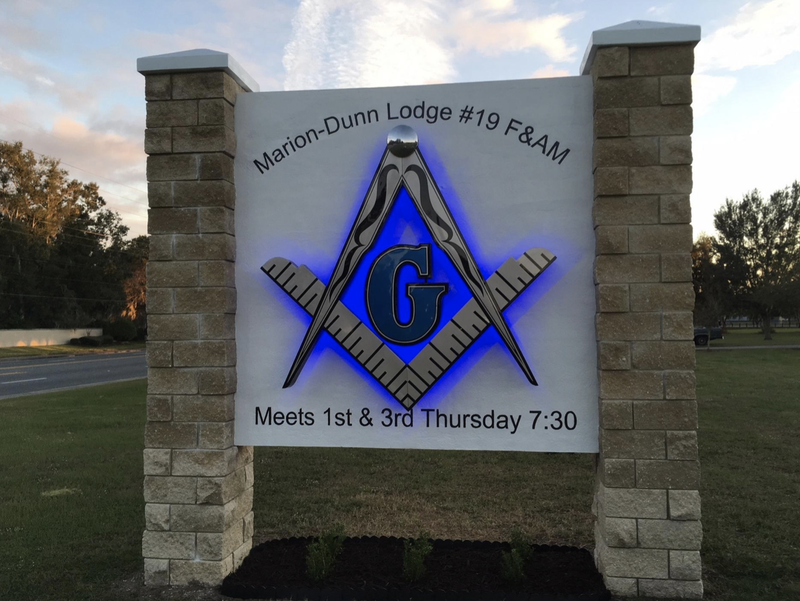 The project was a renovation of portions of the outdoor sign and decorative mount, including surrounding landscape, at the Marion-Dunn Masonic Lodge No. 19 on Southeast 36th Avenue. Austin, 17, an Ocala native, got a tip from his math teacher about the sign and decided to take on the repairs for his community project, one of the requirements to reach Eagle rank. He finished repairs and upgrades to the sign backboards and stone column supports and planted landscaping last week.The mount holds LED lighted components, which were upgraded and fastened to each side of the backboards by a lodge member. The sign now gives off a soft blue glow at night and announces the lodge to passing motorists 24 hours a day. The old sign Austin's has replaced had been inoperative for seven years. Randy Strong, secretary for the 205-member lodge, said the sign has been inoperative for about seven years. 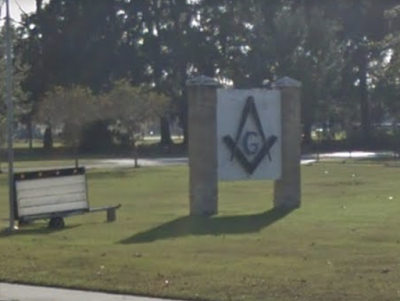 The lighted sign portion is a large Masonic symbol with a “G” in the center, which represents God. 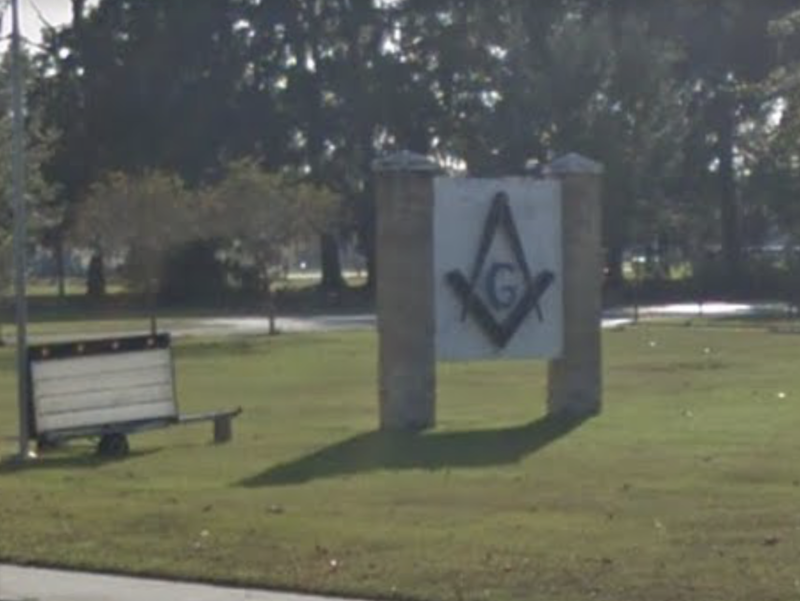 A blue “G” on one side of the sign and purple “G” on the other side pertain to aspects of the lodge and leadership, he said. “This is a big deal for us. Austin worked hard in this,” Strong said. Austin’s project included pre-treating and pressure cleaning, and adding stucco and special reflective paint on both sides of the backboard, which measures 9 feet tall by 9 feet wide. The Eagle candidate wrote a letter and made personal visits to a number of local businesses to solicit donations for the project. He logged 72 hours on the project and enlisted aid from his father, Doug Sherwood Jr. and his grandfather Doug Sherwood Sr., who is an adult Scout leader. Austin deserves every possible accolade and reward that the lodge is able to provide for him for stepping up and accomplishing what their own members hadn't over the years. By the way, Austin has earned 43 merit badges. So far. Looks fantastic lit up at night, well done to all concerned. Wondering if his math teacher, father or grandfather are Masons. Great story. You are right about public appearance. Our symbolism captures the visual attention of the public right away so it is helpful to make a good impression. Sort of like wearing a suit and tie to a job interview. Always try to look your best. 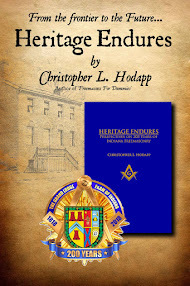 I think it is fantastic that a young man put together a project that helped a lodge who's members should have taken care of a long time ago. I hope someone gave him a petition, or a Friend to Friend pamphlet. He's almost ready.